The past five (GASP) years have been a roller coaster. I grew from being a newlywed to a mom while trying to keep a working foot in the door of my chosen industry. As I constantly found myself looking back to compare what I had done ten years ago to what I have accomplished in the past five, I can finally admit that I am two completely different persons. My blog posts reflect these two individuals, and I hope you can see both as informative from different perspectives. I hold various reasons on why my recent years of blog posts have been barely existent. The key reason is keeping our family happenings out of public eye. Yes, I sometimes do share some photos and events on the social media platforms of Facebook, Instagram, and Twitter. However in general I decided items (such as but not specific to) our medical events, parenting struggles, and household victories are not to be gossiped. What I can share is that a much dreamed about bucket list item is almost done: to be a stay-at-home mom for the first 5 years of my child’s life. 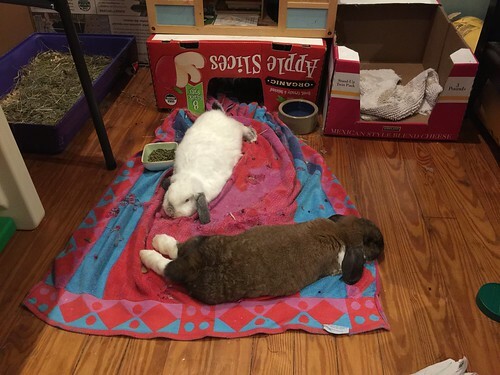 Though SlytherBun starts pre-Kindergarten next month, I already have a schedule full of work projects to complete. 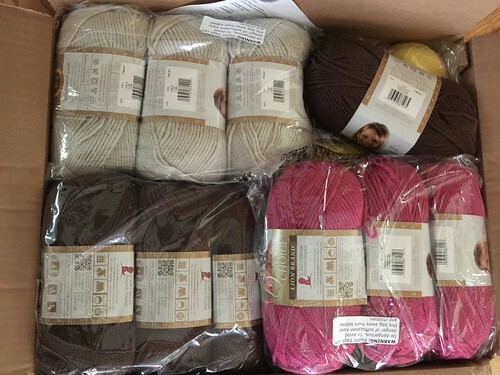 Some of these listed items have been on my yarn-crafting plate for quite some time (cough, at least 3 years or so), but a recent outline has created a reachable set of goals to maintain my (and BFF’s) sanity. One of these goals is to have at least a weekly blog post which will recap my week and maybe discuss my plans for the upcoming week. Ironically this actual entry was supposed to be written a week ago. I had the thoughts running amok in my head, but whenever I attempted to write them down, the rush of emotional words turned into a thin trickle of indescribable feelings. When I was able to convert these thoughts to paper, unexpected interruptions would happen. Today an unexpected conversation with a friend I have not seen in months not only gave me the focus I truly needed, but also the working title of this post. Let’s now go and recap my work week. Shall we? I have been working on a knitted sample in the beautiful KOIGU Kersti Merino Crêpe yarn. As with most items I have a hand in, this project is a future release, and therefore I cannot share juicy details. I can however show you some of the gorgeous yarn involved. If you did not already know, I am an active player in the Ravelry (the social media mecca for yarn crafters) “Harry Potter Knit and Crochet House Cup” forum. As a member sorted into Slytherin House, the colors of the variegated green and grey yarns just make me swoon. Having had one precious skein of Kersti in my personal stash, I can vouch how wonderful the yarn is for the crafter and wearer. Laura Patterson of Fiber Dreams sent out an update of the knitted shawl pattern to her group of testers. I have been enjoying the pattern’s progression, which is just before the changes. Unfortunately I have not had a solid chance to look at the latest instructions. Since this design is also a new release, the photo I am sharing is to tease instead of inform. I was hired by the talented Barbara Benson of Tumped Duck on getting some of her designs into Patternfish. If you have not seen them yet, feel free to take a peek. Best yet, if you like any of them, snag them while you can. Her brilliant designs are not only gorgeous, but her well-written instructions are clear laid out in a helpful format that differs from any pattern I have seen. I am looking forward to when I can knit “La Dame Blanche” as a personal project. Danielle, a local fiber-craft designer has asked for my assistance, and I am currently reviewing her work. Hopefully I will be able to spill the beans about her seriously cute designs sooner than later. My kit for a future spring sample arrived from Susan Gibbs of Juniper Moon Farm. The only detail I can spill is that it is in laceweight. This sample is my second for Juniper Moon Farm. 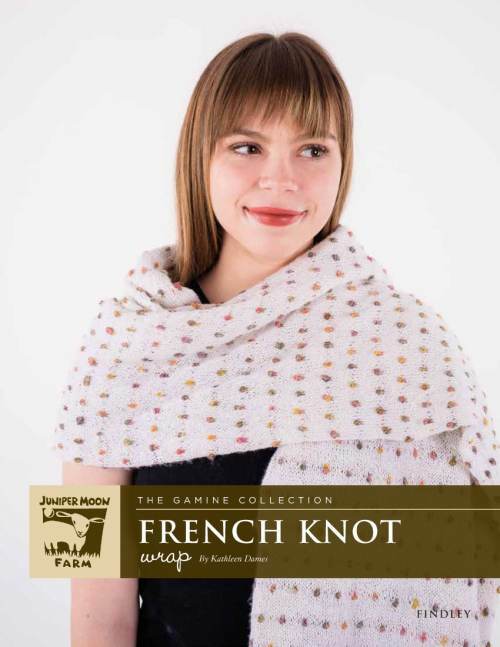 My first one was the French Knot Wrap, just shy of 400g. 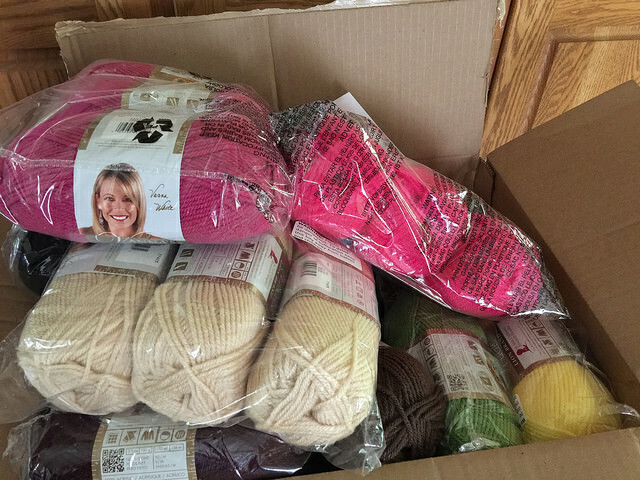 A big box of yarn arrived on my doorstep from Lion Brand. To explain: Because of SlytherBun, our household members are rabid fanatics of Amazon Kids’ Tumble Leaf series. If you have not seen or heard of this multiple Emmy award-winning show, you can watch the pilot episode for free. Since viewing that first episode, I have been sketching inside my mind on how I would re-create both the characters’ fibery-wearables and even the characters themselves. Now these fan-based dreams will become a physical reality. I hope you will join me on this fun (but slightly secret) journey.